Hello! I hope you guys are having a great week so far! I made a cute little CAS card yesterday using probably my favorite My Cute Stamps set Elegant Birds! 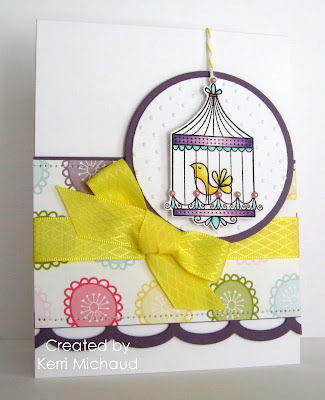 I just LOVE the beautiful bird cages in this set, and of course the super sweet birds:) The dp is more Echo Park Paper Co. Springtime dp and the ribbon is some gorgeous Diamond Satin Yellow from Really Reasonable Ribbon. I also used this week's The Sweet Stop Sketch Challenge #97 for my layout. I'll be back tomorrow with a new challenge card for Your Next Stamp! Thank you so much for stopping by and have a wonderful evening:) American Idol is on tonight~YAY!!! This is vibrant and cute! Adorable little birdcage image. Kerri, I just made a card with the same bird cage, that bird and I used twine to hang the cage like you did! LOL I used a different layout and color scheme. Needless to say, I love this card! LOVE this card! Such a sweet image and fun DP! Yes, I was thrilled to see Jeff win on Sunday! The whole w/e was good in sports...Ohio State is back in the #1 spot and Va Tech beat Duke who had been #1 in the nation. Life is good - lol! Such a darling and sweet card! What a sweet card Kerri. Great colours and a loveley image. The image is super sweet - lovely card and colours! Gorgeous creation sweetie!! 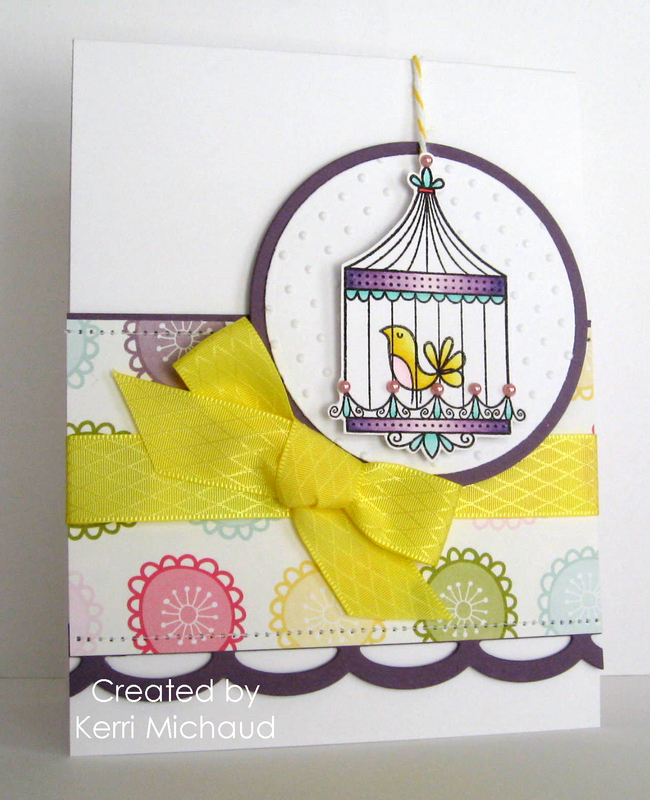 LOVE the pretty bird cage image and your yummy bright yellow bow! WOW! ACK! FABULOSITY girl!!! LOVE these papers (I haven't cut into mine yet!) and the layout and stamps are PERFECT!!! Gorgeous card! Love the yellow ribbon you added! LOVE that you hung the bird cage from the baker's twine, how clever!! Wow! Your purples look amazing! Such a sweet little card with perfect little details!